According to new research, gaining even a modest amount of weight before pregnancy might put you at increased risk for gestational diabetes....even if you stay within the healthy range. It’s common knowledge that being overweight can put you at greater risk for developing gestational diabetes. But here’s some surprising—and frankly frustrating—news: Even a little bit of pre-pregnancy weight gain could increase your odds of developing gestational diabetes. And that happens even if you remain within the healthy weight range. This research comes from University of Queensland School of Public Health and was published in Diabetes Research and Clinical Practice. Researchers indicate that gaining as little as 1.5 percent of your body weight in a year could double (yes, really) your gestational diabetes risk—and this effect holds true even among women who were underweight before they gained the weight. "Women with small weight gains within the healthy BMI range doubled their risk of gestational diabetes compared to women whose weight remained stable," says researcher Akilew Adane, according to a release for the news. "It's important for women and their clinicians to be aware that, even in the healthy BMI range, gaining a kilogram or two a year can be a health risk." Ultimately, this research does introduce an important idea: That keeping your weight as steady as you can is a smart idea, especially if you're trying to get pregnant. 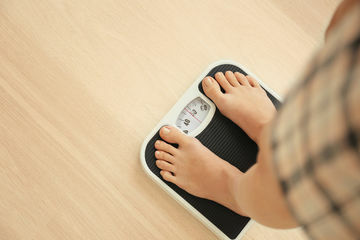 But here's what we say: It might be smarter to focus on the choices you're making as opposed to the number on the scale. After all, if you gain a few pounds because you're indulging in donuts too often or neglecting those workouts, it stands to reason that these lifestyle factors might increase your odds of health issues during pregnancy. You should be eating well and working out often if you're trying to conceive for a whole host of reasons. Our take? This news is just another sign you should be leading as healthy a life as possible before and after you conceive.